Let us deny the “shooter/killer” the fame he wants! I cannot help but think that this guy’s motivation was to become famous. He had no intent of killing himself, or being killed. He had on a bullet proof vest on. He gave up without a fight. He set up his home with bombs and other devices to take out more people - to get a higher body count. I think the best thing we could do is not use his name, don't give him the fame. He is the killer or some other "name" such as the suspect. Don't use his name, don't give him the fame - morn those that died and have been harmed by him, but don't give him the time of day. Let us keep politics out of this. Gun control or lack of gun control did not cause the Denver Batman shootings. A man determined to kill found a way to do it. He would have been willing to buy illegal guns if legal guns had not been available. He made bombs and other devices - if he could not find guns he would have made more bombs and other devices to use. Think about it. This is not a gun issue. It is about someone determined to kill. Time to make stars out of the victims and let him fade away as someone not worth our attention, because it is the attention he wanted and is getting. He is not worth it, the victims are. If we give him attention he wins. He gets exactly what he wanted! I know the media is unlikely to call him the Suspect now that he has been identified, but I think it would go a long way to honor the victims if they all made a point of calling him the Suspect or killer and withheld the fame he seeks. Stop plastering his face everywhere. The media are not the only ones guilty of feeding his need for fame. People are already using his picture to make posters and statements about him. Stop doing that. Make your statement without his name or picture. I don’t care if it is for more gun control or a statement about how stronger gun control would not have helped. He should not be the focus – give the victims fame, not the killer. I already know that my view is not very popular. People want to know about this guy and why he did this. Simple, he wanted to kill, to be famous. Other people will take this as I am for guns and others for more gun control. Sorry but I am not making that type of political statement. I simply don’t want him getting the fame he wants. Simply put – An armed man killed 12 people and physically and mentally harmed countless others in Aurora, Colorado early in the morning of July 20, 2012. He used guns to kill. He put bombs in his home to kill even more people. Fortunately the bombs were disarmed before they could harm anyone. He was a person with issues, and wants to be famous. The victims deserve more than becoming his means to fame. Celebrate the victims and don’t give him the attention he wants. 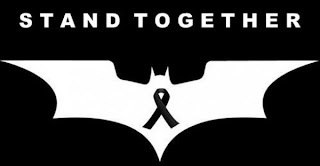 I am proud of how some people have handled this horrible event – Such as this article The Batman Shooting. Fundraising and support for the victims is much more valuable than any attention given to the “suspect”. 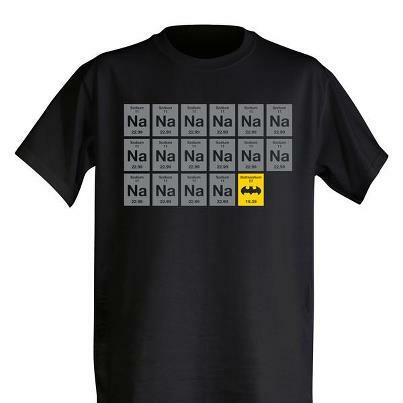 I fully support the Think Geek fundraising and only wish they would have more (Sodium * 16) + Batman shirts printed as they sold out to quickly for most of us to be part of this. We need more of this type of articles and corporate support with the focus on the event and victims – not the man who caused this. I totally 100% agree with you. The news media is out of control - They continue to dig for "news" related to this story that they deem to be relevant in order to sell more papers or get more hits on their websites. The fact that the killer had a beer with some random guy 2 days before the shooting is not relevant. The fact that he wrote a paper at med school is not relevant. This is desperation to grab onto a popular topic and is lazy reporting. We are giving him attention he does not deserve and showing others that they, too, can be famous if they are willing to do something horrible. This is likely the reason why we are reading about yet another shooting today by an 18 year old with multiple victims. Don't make these people famous. Leave them in obscurity where they can live out their miserable lives alone.